You would be hard pressed to find anyone, especially among our fellow lovers of horror stories and tales of terror, who doesn’t know who Edgar Allan Poe was. Best known for his poetry and short stories, Poe was also highly regarded as the leading author of Romanticism in American literature and he was one of the earliest American authors of the short story. 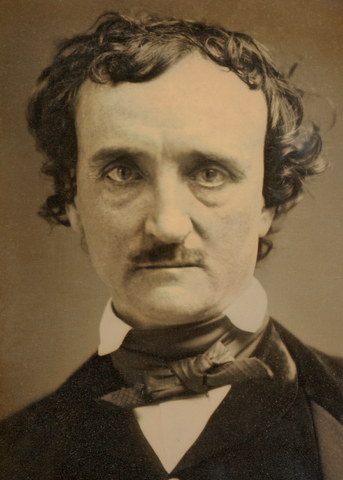 Edgar Allan Poe’s best known fictional works were in the Gothic genre, which was very popular at the time and the main reason he wrote the genre. The main, recurring themes of a several of Poe’s works dealt with the questions surrounding death, fear of premature burial, coming back from the grave and mourning. Several of Poe’s works were considered to fall into the dark romanticism genre, which focused on human fallibility and being prone to sin and self-destruction and also the difficulties with adjusting to social acceptance. Aside from horror, Poe also wrote satires, humorous stories and hoaxes, which may be a little hard to believe considering the bulk of his other works. Poe was known for using irony and ludicrous extravagance for comic effect. Often times, Poe would use these characteristics of writing as an attempt to liberate the reader from cultural conformity. The concept of hiding clues in plain site, so they are overlooked by everyone who is searching for them. The planting of false clues by the criminal. The concept of observation and deduction. These are only a few of the concepts used in today’s detective stories that Poe created. Poe also wrote other stories that did feature crime and/or mystery, however, they weren’t considered “true” detective stories because they don’t lay out all of the clues for the reader to solve the crime, so they were considered not “playing fair” with the reader even though they are excellent mysteries in their own right. Aside from his famous and extremely popular short stories and poetry, Edgar Allan Poe was also recognized for his work as a literary critic. Many people only think of Edgar Allan Poe as the author who wrote The Tell-Tale Heart and The Raven, but he has done so much more to entertain, enrich and even teach. Thank you for taking the time to visit my blog. If you enjoyed this article, please join my mailing list to make sure you don’t miss a single informative and entertaining article as soon as it’s published. I encourage you to start or join a discussion by adding a comment at the end of the article. Please contact me at michael@mdtcreative.com and I will put my 15+ years of experience to work for you. Let me start spreading the words for you! Thank you so much for your kind words. I honestly feel that I have accomplished something if you think my work is well penned. I have seen your works and I know that if someone as talented as yourself likes my work I am truly gifted. I must admit, after seeing your comment, I first took a look at your site and was very impressed with your writing. I would also encourage anyone who is reading this comment to take a look at this lady’s works for true inspiration. Thank you for your kind words but more importantly, thank you for sharing your gift of writing with all of us. Oh yeah! He was a master that is for sure. And such a tortured soul, I’ve often wondered if you need to be such a tortured soul or have a severely conflicting mind to write some of the literature that is so popular. What is it that makes a person a “creative” sort? I think this would be an interesting conversation to have. So what do you say my friends? What makes a person truly creative and a literary great as we have seen in the past? I look forward to a good conversation on this topic. Interesting to learn he had a sense of humour, something we don’t often associate with Poe! Also that he was a literary critic! Who knew? Educational and interesting post, as usual! Good job! IKR, yeah I never saw the sense of humor thing coming into play. I always figured he was a very strange individual (oh wait he was lol) I’m really glad you enjoyed the article. Thank you for your interest in my article I really appreciate it.